Why don’t we start off by telling us a little bit about How the idea of the guide came and how it’s develop over the last 10 years? 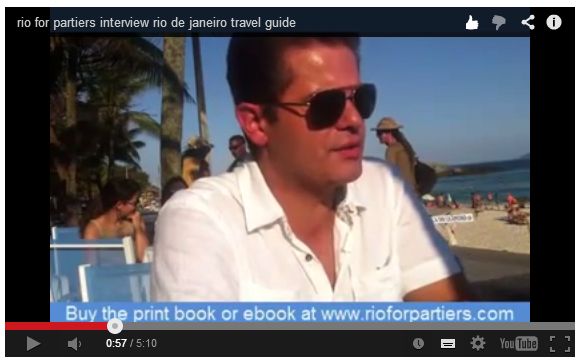 Rio For Partiers was started 10 years ago. I had moved from Chicago back to Rio after living there for 16 years. 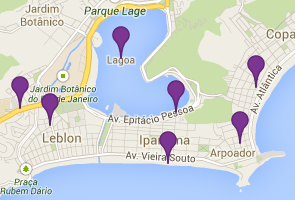 And I realized that Rio didn’t have a proper travel guide. And all the other travel guides Frommers, Lony Planet, were all out dated.And back then.. and uhm.. Not only that it need an updated travel guidebut I also need an easier to read, easier to consume travel guide.And early off back then all the existing travel guides were 300 page manuals. That nobody had.. the patience to read.. You would spend 3 weeks reading something to enjoy 1 week in Rio.I say I am gonna come up with a.. you know, like a more visual travel guideThat’s gonna have a lot more photos. Everything is going to be explained visually. So that people can consume this in an hour.What tips would you have for tourist that are coming to Rio?The first one would be to get “Rio for Partiers” just to get the… travel guide I wrote. I believe inI designed this to give the tourist the best, my readers the best possible time here in Rio.Everything in here was very consciously thought of just about foreigners. Whether it’s americans or europeans or anybody So, I am writing in Rio so they can hit the ground running. Go, do the best activities during the day. Best activities during the night. Enjoy the best food Rio has to offer and just really immerse your self in Rio culture. The Carioca culture. What part of your book are you most proud of? I’m a foodie. So, whenever I go somewhere all I really care about is the food and best things that they have there. You could tell me if this is the oldest church in the world or you know whatever It’s not as impressive to be as eaten like the best croissant, or whatever.So, in this section is something that we did spend quite a bit of time on over here in the book.- Its the chapter – called “All the stuff to get to try”. So, we have street foods and snacks.Bar foods, desserts, stuff you never ate. Just stuff you’ll find in a supermarket and grocery stores that’s unique to Brazil or to Rio. And everything you should drink alcoholic or none and fruit juices.So I think this section is the one I am most proud of but at the same time you know we do have few innovations that I am proud of as far as travel guide content goes which is like for instance the night life.You know we think night life is divided to everyday of the week. So sunday, what do we recommend if you’re in the mood to go out? We have clubbing, we have live music, we have street party. Street parties happen every night, every day of the week, year round.And then you know a chilling or relaxing and lounging options. So, we do this for all nights of the week and a lot of other travel guides have now started to pick up on this format. I guess it’s just very practical.I think the other part of the travel guide is it’s very useful to my readers.It’s the fact that you got to spend $28 on the travel guide right.You’re gonna save easily $300 you think all these caipirinha..Actually right here where we are sitting right now Azul Marinho, this very first caipirinha hereSo, you know this caipirinha that I am having over here is gonna cost me zero. I’m gonna give them a tip because you know the waiter did served us.Plus I’m gonna pay for my caipirinha. All these discounts we have negotiated for our readers are available. You’re gonna save easily over $50. Easily over your investment on this travel guide. And this itself is worth it because all these places are the places you want to be at. These are the places we recommend anyway in our travel guide.So you can easily get your money back.